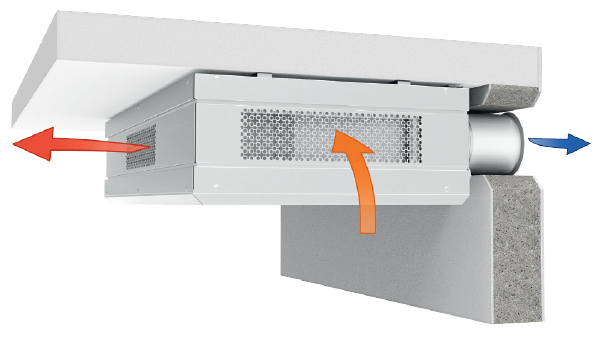 The CIVIC EC DB units are designed for single-room ventilation of schools, offices and other public and commercial premises. Air flow up to 510 m³/h. 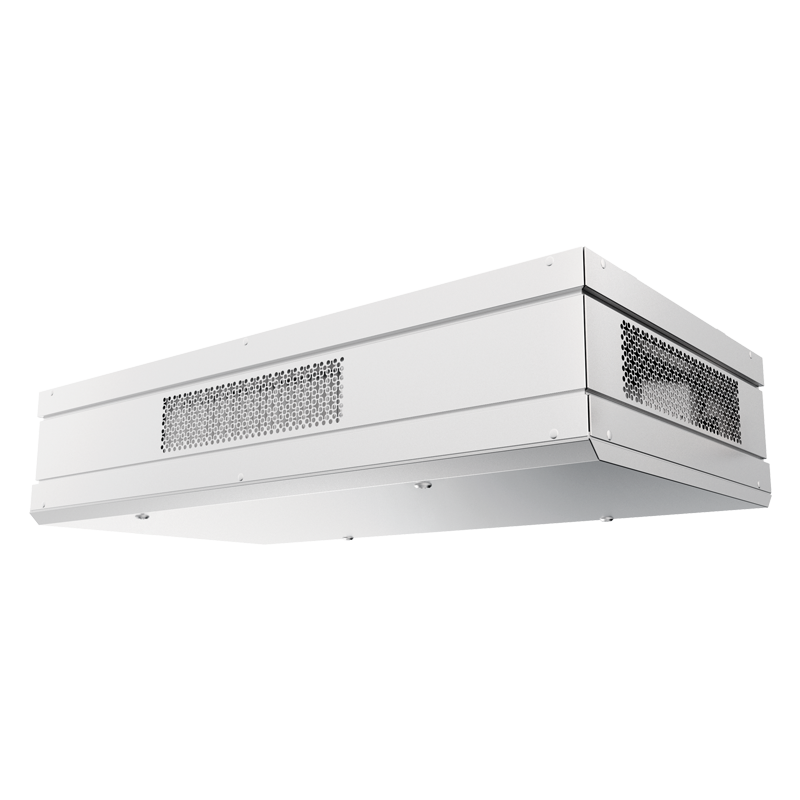 The CIVIC EC DB units are designed for single-room ventilation of schools, offices and other public and commercial premises. Offer the ideal simple and efficient ventilation solutions for existing and renovated buildings and require no layout of air ducts. Efficient supply and extract ventilation for separate premises.EC motors with low energy consumption.Low-noise operation.Simple mounting. Made of high-quality polymer coated steel, internally lined with heat- and sound insulation of mineral wool or other materials.Available modifications with an integrated preheater and reheater for cold climate applications. High efficient electronically commutated motors with external motor and impeller with forward curved blades. 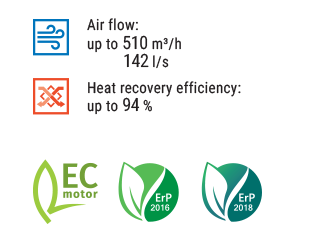 Such motors are the most state-of-the-art energy saving solution.EC motors are featured with high performance and total speed controllable range. High efficiency reaching 90 % is the premium advantage of the electronically commutated motors. Supply air is cleaned with G4 and F8 (PM2.5 > 75 %) supply panel air filters. For premises requiring high air quality it is recommended to install carbon F8 filter or H11 (PM2.5 > 95 %) filter. Available as specially ordered accessories.Panel G4 filter is used for extract air filtration. The units are equipped with a bypass. The bypass damper opens for free cooling ventilation mode in summer. CIVIC EC DBE and CIVIC EC DBE2 units are equipped with an electric preheater which protects the heat exchanger from freezing. CIVIC EC DBE2 units feature an electric reheater to raise the supply air temperature. The automatic supply and extract air dampers are used to prevent uncontrollable air draughts during the unit standstill. The ventilation units may be operated with an integrated or an external control panel. • - available; ○ - option. The CIVIC EC DB unit has a counter-flow heat exchanger made of aluminium. • In cold season the heat energy of the extract air flow is absorbed by intake air flow, thus decreasing the heat losses caused by ventilation. Condensate generated during heat recovery is collected in a drain pan and removed through the drain pipes to the sewage system. • In warm season the heat of the outdoor air is absorbed by extract air flow. This way the supply air temperature decreases and heat recovery reduces operation loads for the air conditioner. Cold outside air flows through the filters and heat exchanger and is moved to the room with a supply centrifugal fan.Warm polluted air from the premise flows through the filter and the heat exchanger and is exhausted outside with an extract centrifugal fan. The freeze protection function may be realized by two ways. For the units without preheater: the supply fan shuts down on a signal from the exhaust air temperature sensor to let warm extract air flow warm up the heat exchanger. Then the supply fan turns on and the unit operates normally.For the units with a preheater: the supply air is warmed up before contacting the heat exchanger, thus preventing its freezing. In this case balanced air exchange is not interrupted.